the ideal types that he believed were embodied in all living forms. Agassiz's vision arose from his insistence that the order inherent in the diversity of life reflected divine creation, not organic evolution. But the mortar of the new museum had scarcely dried when Darwin's Origin was published. By Louis Agassiz's death in 1873, even his former students, including his son Alexander, had defected to the evolutionist camp. Alexander, a self-made millionaire, succeeded his father as director and introduced a significantly different agenda for the museum. 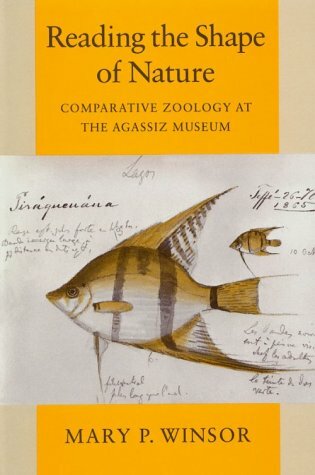 To trace Louis and Alexander's arguments and the style of science they established at the museum, Winsor uses many fascinating examples that even zoologists may find unfamiliar. The locus of all this activity, the museum building itself, tells its own story through a wonderful series of archival photographs. ""In the Prime of His Admirable Manhood""
""I Have Been Disappointed in My Collaborators""
""Our Work Must Be Done with Much More Precision""
""An Object Worthy of a Life's Devotion""
""The Many Plans Started by My Father""
""Shall We Say 'Ignorabimus,' or Chase a Phantom?"" ""The Slender Thread Is Practically Severed""
""Results Unattainable by Museum Study Alone""
""Collections Never of Use to Anyone""
""Dependent on the Personal Feelings of the Authors"